After a year in Australia, I summarised my three favourite day hikes in that wondrous country. It seems only fair therefore to give New Zealand a similar treatment, particularly since hiking (or tramping, as it is known locally), is a major highlight of any visit to New Zealand. All the hikes in this section are possible in a day for a reasonably fit person. If you’re not a regular hiker, I’d highly recommend giving my guide to preparing for a day hike post a read through, it’ll help you prepare properly for any trip you undertake. Hiking is an amazingly fun sport with tremendous reward, but as with any outdoor activity, there is an element of risk – preparation is the key to success! Mount Cook is New Zealand’s highest mountain, towering above it’s spiny brethren in the southern alps. Climbing to the top of it is not the sort of thing one tackles as a day jaunt – this is serious mountain climbing country which has been tackled by world famous climbers such Edmund Hillary. 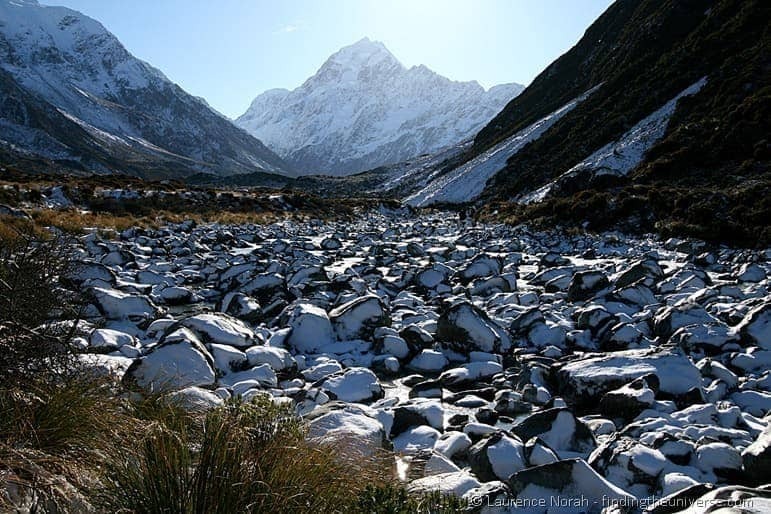 However, you can get some epically rewarding day hiking achieved around the base of this mountain, starting from the Mount Cook village. One walk that stood out for me in this area was the walk to the lake at the foot of one of Mount Cook’s glaciers, a three – five hour return walk that crosses snow covered boulder fields and a number of glacially fed startlingly blue rivers. The walk isn’t particularly tough, other than being potentially slippy due to snow and ice, but the views are absolutely mind blowing, as Mount Cook looms over you, with snow coated mountains all around. Enthralling stuff. 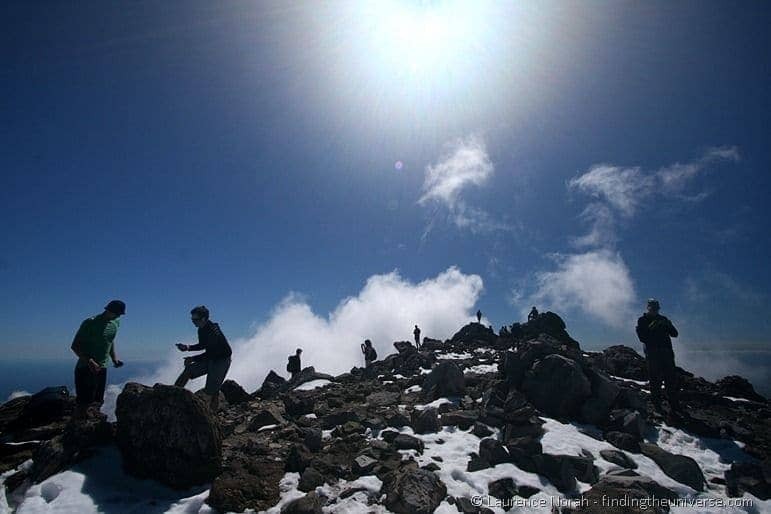 No summation of day hikes in New Zealand would be complete without mention of the Tongariro Alpine Crossing – the walk which most people just refer to as “the Crossing”. This is a 20km, 6-8 hour one way hike across the remains of Mount Tongariro, a volcano which, before it blew its top, was easily New Zealand’s highest mountain. 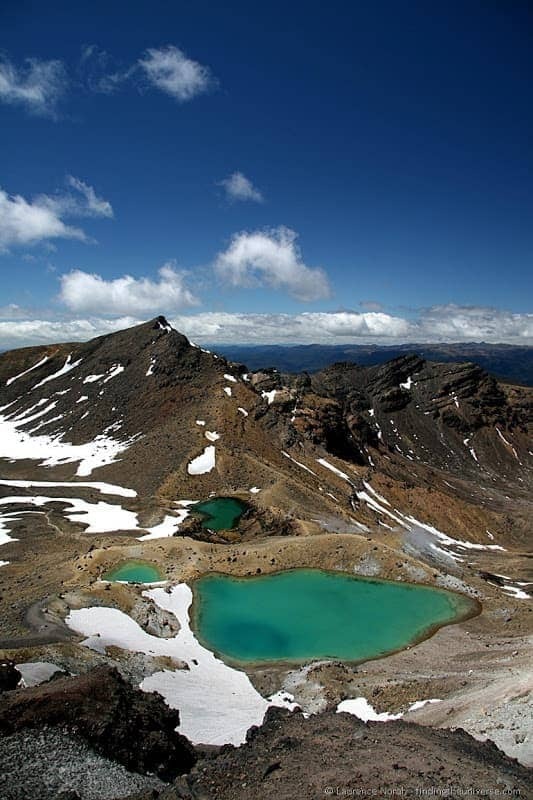 These days the mountain is a couple of thousand metres lower than Mount Cook, but the walk, across craters, around smoking volcano cones (this area is still very much active), and past lakes whose colours have to be seen to be believed, really is a must do. 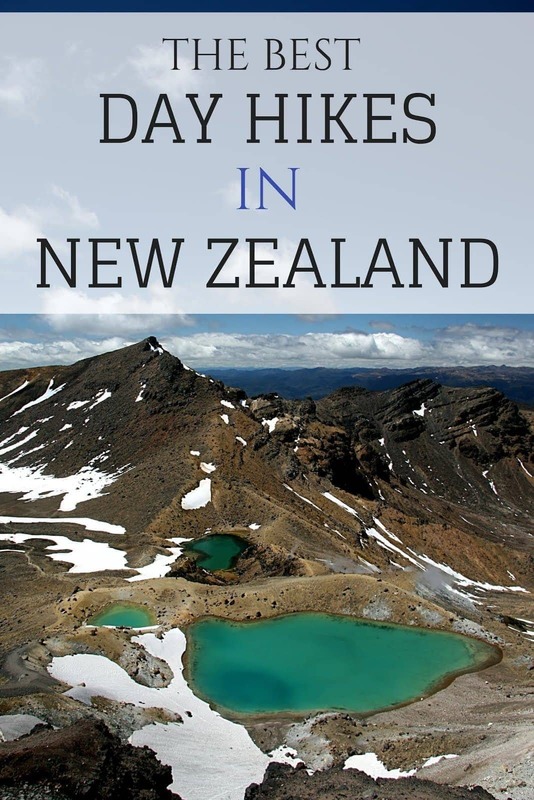 Unfortunately, this is one day hike that is on the must do list of pretty much everyone who comes to New Zealand – so don’t expect to be hiking alone. On busy days upwards of 1000 people will be tackling the hike, so it can feel like more of a commute than a walk with nature. You can avoid the crowds by visiting either earlier in the season (around October time) or much later on. Alternatively, try taking the Mount Ngauruhoe side route instead. This is a seriously challenging climb, and not for the faint hearted, requiring you to scale a gigantic pile of loose ash to the summit. The views from here are breathtaking though, and you will be guaranteed to be sharing them with fewer people. Just don’t take too long – the hike is one way, and the buses at the end won’t wait forever. 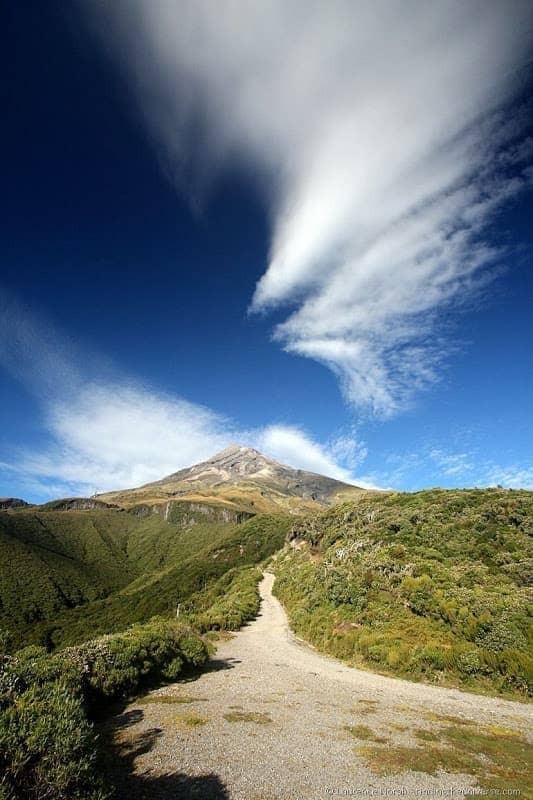 If I had to pick one hike in New Zealand that was my absolute favourite, the walk up Mount Taranaki would be it. Way out on the west coast of New Zealand’s north island, this incredible volcano rises vertically from sea level and flat, rolling fields, to an eye watering 2.5km in height. This is actually a pretty dangerous walk, and nearly seventy people have lost their lives tackling this summit. For this reason, it is imperative that you check the weather conditions with the DOC office at the start of the track, and register your intentions with them in the booklet. It may only be a 6-8 hour walk, but being right on the coast, the weather conditions here can change incredibly quickly. We were lucky to have perfect conditions for our climb, with only a tiny bit of snow up in the crater itself. 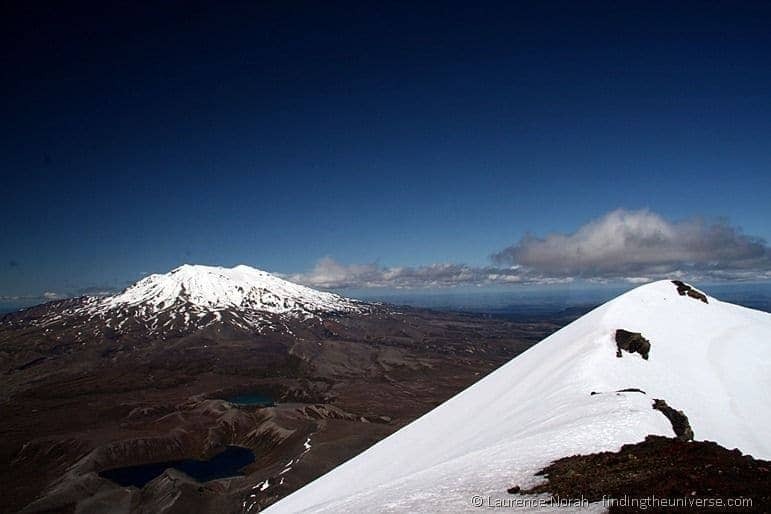 The views of the North island, right across to Mount Tongariro and Ruapehu, some 180km distant, have to be seen to be believed – when you’re not desperately trying to climb on to the ground that is. This is a walk which is not for vertigo sufferers. If you get the chance, and the right weather conditions, I cannot recommend this hike enough. Back on the south island again, the Key Summit track is a wonderful walk which shouldn’t take you more than a couple of hours. It follows the last part of the world famous multi-day Routeburn track in the Fiordland National Park, branching off to ascend the Key Summit. The walk, although largely up, isn’t particularly strenuous, and is worth doing either on your way in to or out of Milford Sound. 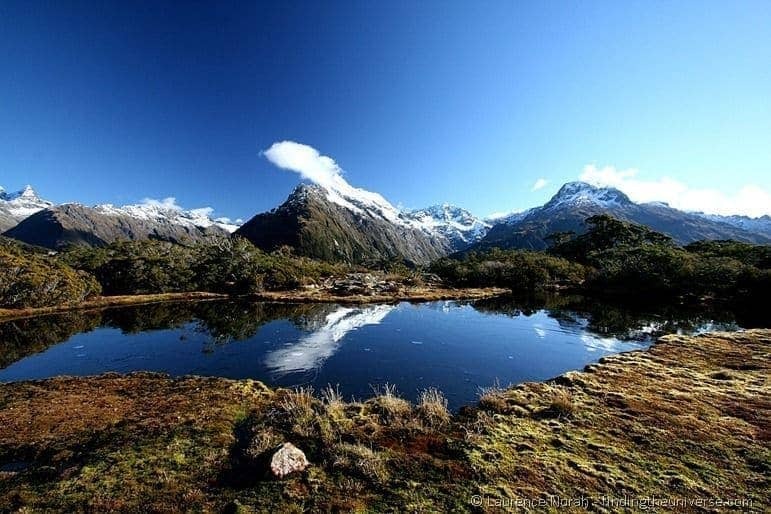 The reward, of views across the Fiordland National Park, is entirely worth it., with spikey mountain peaks, glacially carved valleys and rolling forests in all directions. A small taste of what the Routeburn track may hold in store, if you have more time and the urge to tramp for multiple days. Last on my list of my five favourite walks in New Zealand is the Rob Roy glacier track in the Mount Aspiring National Park – a 50km drive from the town of Wanaka on the South Island. 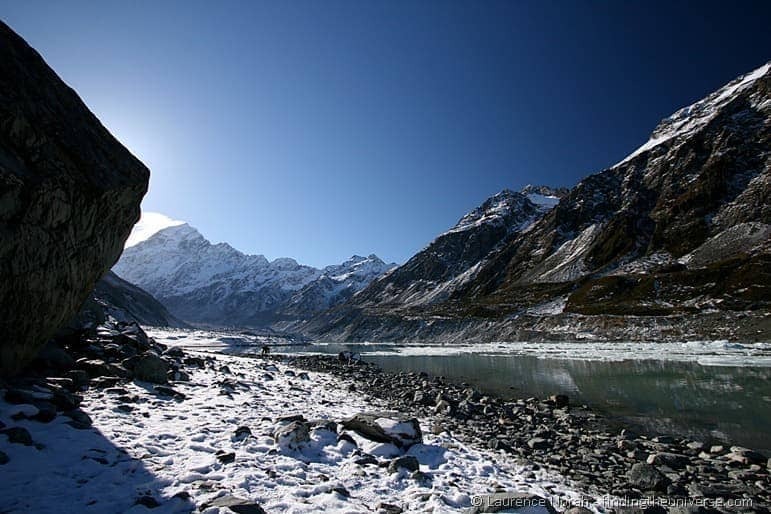 This area is renowned across New Zealand for being home to a huge number of ski fields. When we visited though the snow hadn’t quite set in, so tramping around was still possible. Lots of ski fields mean lots of mountains, and the walk up to the Rob Roy glacier is an absolutely astounding walk. Taking 3-4 hours, this is a moderately strenuous walk which works it’s way up through the tree line in the Mount Aspiring National Park, before bursting you out into a tundra filled valley, where a spectacular glacially coated rock face towers above you. This is a tremendously challenging place to take decent photographs given the scale on offer, but I assure you, if you do this walk, you will not be disappointed by the view. If you found this post helpful, you might like to check out my New Zealand guide section of the site, where I offer all kinds of advice, from must see attractions, through to practicalities such as buying a vehicle, finding a job and even finding free internet. Finally, a fellow blogger wrote an excellent guide to your first time in New Zealand, which I found to be invaluable for my trip. Finding the best deal on your accommodation is an important part of trip planning – helping you to get the most from your budget, as well as find the property that is right for you. Our current favorite way to find the best deals on accommodation is with HotelsCombined. These guys let you search over 100 booking sites at once, including booking.com, Agoda and TravelPony, and nearly always get the best price. Try them and see! If you prefer an apartment or more of a hosted stay, then I recommend AirBnB. I’ve tried all the others, and AirBnB consistently has the most options for locations around the world. Plus, if you’ve never used them before, you’ll get a $25 discount on your first booking with this link! Between these options, you should find the best prices and places to stay for your trip, as well as a good selection of reviews and feedback to help you make an informed decision. And that is that for my five favourite day hikes in New Zealand. Looking for more inspiration? 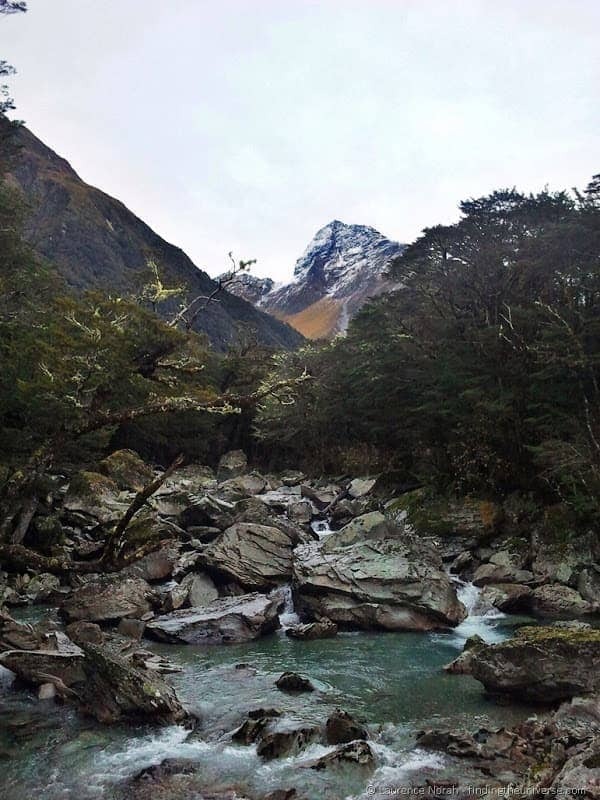 Check out fellow blogger Agata’s post on her experiences Trekking in New Zealand. And, if you’ve got a favourite hike in New Zealand, or somewhere else in the world? Tell us about it in the comments below! Hi thanks for the lovely post. Am traveling to NZ in the month of June (2nd week).. I really don’t know why I had always been a big fan of tongariro crossing it’s more like a dream for me to complete it. I’ll be on my honeymoon still I would want one day dedicated to hike which I’ve never experienced before., So yeah we are amateurs. But it’s fine for me to give one day as hike so that we remember the day thinking oh yes that was the day we did a hike. Could you help me out in deciding.. which would be your personal favorite between Tongariro or Mr Cook. Or for the winter climate in June which one would you suggest. This is the first time I would be visiting NZ and possibly be the only time. Your inputs will really help me in finalising my itinerary as I have added another day near Taupo so that I can do tongariro hike. Please advise 🙂 Thankyou in advance. OMG !! Such an immediate response.. am just so glad. My heart wanted to hear the tongariro ?. am super duper happy. Thanks a lot Laurance you sorted out things for me. It really means a lot to have a reply from a first hand experienced person. Am so relieved now. Would you be willing to help with my itinerary, as in the itinerary is made I want a fine tuning for south island, plus I have a spare day I wasn’t able to decide where do I put it to. Hi Kirthi! My pleasure. My suggestion would be to check out my one month itinerary to get some ideas for what I would do. You are welcome to share your itinerary of course, and I will do my best to help if I can, but it’s really hard to offer specific suggestions as everyone has different interests. Thanks for being so nice and extending your help Laurence, really appreciate it. Need your help in freezing my itinerary. Starting from June 7th for 17 days covering both island. D16 – Auckland to return. 1. Pls help me sort out south island, as Queenstown and fox glacier would be of too much driving. On south island I wanted to do fox glacier, wanaka, Queenstown. Or if possible tranzapline train then to fox glacier then Queenstown. 2. I also have another day in hand, which would personally be your choice of place you would want to extend a day at. 3. Any place you would recommend to sacrifice (being winters) for a little relaxed holiday so that I could spend that day at the other place making most of it. Thank you for sharing this. We are truly blessed with amazing walks in New Zealand! Good list. I have done about half of them but my favorite out of all of them was Abel Tasman. I thought that place was great and the best out of all that I did. Awesome to hear Maddie, delighted you had a great time, and thanks for letting us know. Apologies it took me a while to reply! Just wanted to say thanks for this great post! We’ve ended up doing all of the hikes apart from Taranaki and they’ve been great. You hear so much about the Great Walks but I was struggling to find good info about shorter day hikes. My pleasure Jenny – thanks for leaving a comment! I’ve taken notes! Thank you! I booked it around the Otago Peninsula yesterday and did a few gorgeous (and easy) walks. It was lovely and if anyone finds themselves with time to kill while they’re in Dunedin, I’d highly recommend checking it out. Adding these hikes to my list when I go visit next year. They all sound amazing. Must get into shape first! The Key Summit looks amazing!! I’m bummed that I still haven’t done the Tongariro crossing yet. But it’s still on my “to do” list for NZ!